Stradbroke is no stranger to bushfire. We all have our recollections of fires of past years, power cuts and close shaves. Many an interesting conversation on the island gets on to how different areas are recovering: Blue Lake regenerated quickly after the fire of ’95, but the slopes near the S-Bends had bare trunks visible for many years. But the fierce 2014 fire will go down in history and will, we hope, be a turning point in the adoption of proper fire management strategies for the island. 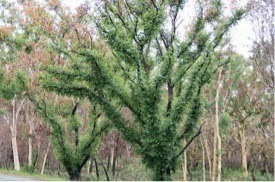 Although the bush looks devastated in parts, the natural processes will in time bring it back. 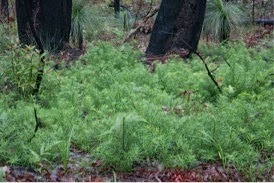 In areas where the natural biodiversity has been replaced by miners’ revegetation the bush is reportedly more severely damaged and will likely need human intervention to replant and keep weeds under control. 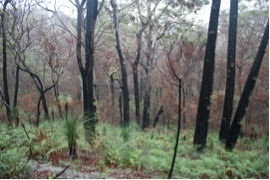 Some plants of the coastal bushlands on Stradbroke Island have developed defences to survive fire, for example: pale reflective bark helps the ubiquitous scribbly gum hang on, while the thick insulating layers of warty-barked banksias and rugged ironbarks and blackbutt eucalypts help them tough it out, a multiplicity of delicate layers protect paperbarks. Survival of wetland species is high as long as there is standing water, but if the swamps are dry, peat fires can ignite and do immense harm. One of the toughest plants on the island must be the amazingly fire resistant Xanthorrhoea johnsonii (grass tree). The trunk contains a protective resin which, when damaged, oozes like blood. But these wounded soldiers are survivors standing sentinel on the bare slopes of the high dunes watching for recovery. 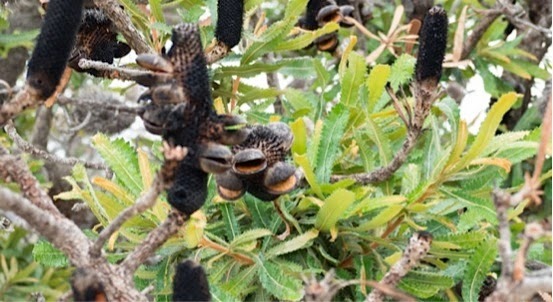 Large parts of the island have fire dependant ecosystems with different species of plants having evolved mechanisms to reproduce, as they draw sustenance from the nutrient bearing ash bed. An indication of the continuing resiliance of the island bush is the pace of regeneration which has been quite astounding in many areas considering how little rainfall we have seen this year. No one could help but feel for the poor creatures that had to endure the fire and for those who could not survive the onslaught. Not many dead or harmed animals were found after the fire. While there was no doubt a toll, animals have well known survival instincts and strategies. Faster moving animals have the ability to flee from fires while the slower creatures can sometimes successfully seek shelter by burrowing in the ground, under logs, hollows or in the base of tufted plants. 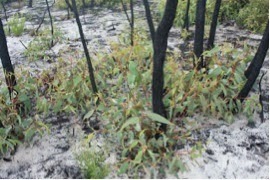 Bushfires are uneven in intensity and moist gullies and creeks can provide nearby protection for a quick escape. According to reports some koalas were found in moist dips after the fire. Recent scientific research does indicate that fortunately even after intense fires koalas recolonize burnt trees for food and shelter within 3 months. Other good news is that research also indicates that the specialized acid frogs that inhabit coastal wetlands tolerate fires as long as standing water is available. Fires, it must be remembered, also create habitat. Dead trunks and burnt out hollows in old growth trees become homes for insects, reptiles, birds and gliders. Clearing for mining and destruction of bushland in extremely hot burns puts recovery of the animals at risk. The fragmentation of habitat that we are seeing on Stradbroke, may prevent effective recolonisation of areas by different species. The best way to ensure the survival of animals and the island’s biodiversity and resilience is to retain large areas of intact and diverse bushland. Only well researched and effectively implemented fire management and cessation of clearing for sand mining can achieve this aim. Fire management is undoubtedly a hot topic in Australia with preservation of human life always rightly given the first priority. But for those authorities and businesses who are given custody of our natural areas this often comes with a regulated obligation to manage fire regimes and on Stradbroke there has been a breakdown of miner Sibelco’s obligations. There is an urgent imperative for all landholders to develop fire management strategies consistent with their particular responsibilities. After all, out of control bushfires, contributed to by lack of fire management, don’t only threaten bushland but threaten life, homes and probably real estate values. Traditional owners of the land understood fire much better than Europeans and an increased knowledge of their practices must inform future fire management.